I discovered a small oddity on my ground pads. 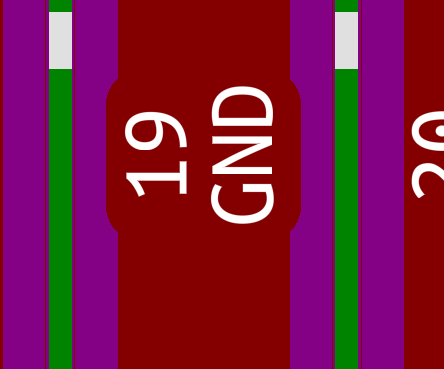 The groundpad (of a plain QFP package) has a part which is slightly wider. 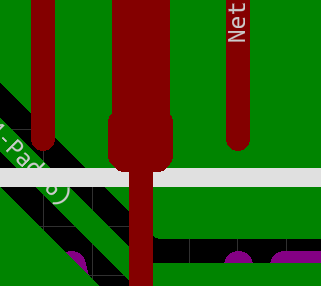 When the pads disappear, the other nets finish with their original width (0.125 here). The ground pad connection comes from the copper fill. Why this wider part? Might have something to do with thermal connections. I guess kicad tries to make a thermal here but fails because of nearby pads. This would be a bug. Copper fills have their own unique clearances. If they are less than the set track/track clearance then this kind of pattern can emerge. Thanks for your reply. Indeed, it disappeared after reworking the footprints I use. I just edited the footprint preferences. So that must depend on pad clearance.